1. Bring a large pot of water to a boil. Cook pasta until just tender, 9 to 11 minutes, or according to package directions. 2. Meanwhile, cook sausage in a large nonstick skillet over medium-high heat, breaking it up into small pieces with a wooden spoon, until cooked through, about 5 minutes. 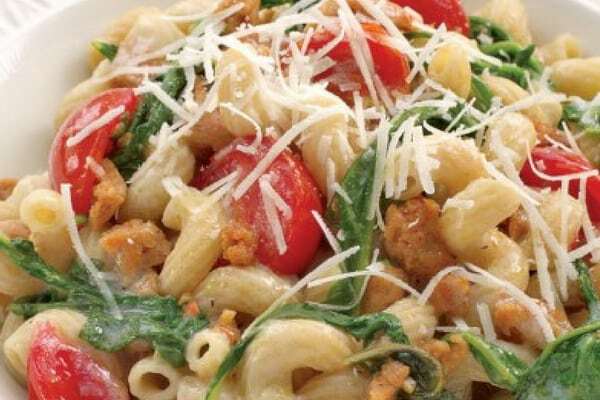 Stir in garlic, arugula (or spinach) and tomatoes. Cook, stirring often, until the greens wilt and the tomatoes begin to break down about 3 minutes. Remove from heat; cover and keep warm. 3. Combine 1/2 cup cheese, pepper and salt in a large bowl. Measure out 1/2 cup of the cooking liquid; drain the pasta. Whisk the cooking liquid and oil into the cheese mixture; add the pasta and toss to combine. Serve the pasta topped with the sausage mixture and an extra sprinkle of cheese, if desired.